while our philosophies are similar, i think our execution/implementation of them are different. so IMO the best way to solve that is to beat someone "normally" and if it's "easy" change your strategy without telling them, in such a way that equalizes the game, and improves something i need work on (ie. always hit dtl bh to their fh, or s&v if i'm a baseliner, or only slice, if i hit too big (or vice versa if they can't deal with slice)). then the other side maintains their ego, if they lose... or has somethign to be happy about if they win (vs. how satisfying is it to "win" if i spotted you 9 points in a 10 point game?). That is true. That's why one of the prerequisites is that it's implemented in a fixed group, with frequent players who kinda know each other. We were talking about such type of groups and people, right? Those that we semi give a damn about. They're more reliable as playing partners than random strangers. Your "best way" is difficult for me though. It's hard to fake your level with those who know you. Say, I'm a baseline grinder and would kick person A handily, then one day I play s&v and struggle and look like an *** in the process. Person A will think that I'm horsing around. Frankly, I do this alot with those who are lower level and i can't approach the handicap approach with them. I always take advantage of an easy game and try stuff and get the game score to 6-4 or 7-5 (no point in leaving early). Guess what? They always know that I am not trying my best, I'm horsing around and they don't seem interested to try. What's their solution (to have an even match)? They pair me up with the worst, fattest, oldest guys! Also, it's interesting that you talk about ego. You participate in martial arts where you guys get physical hits and everyone is ok, leaving ego outside? (just curious, I would think it would hurt the pride even more) But tennis players are a lot more touchy over a tennis loss? Are tennis players some sort of special, more fragile nerved breed of people? Just interesting how perception goes for different people. 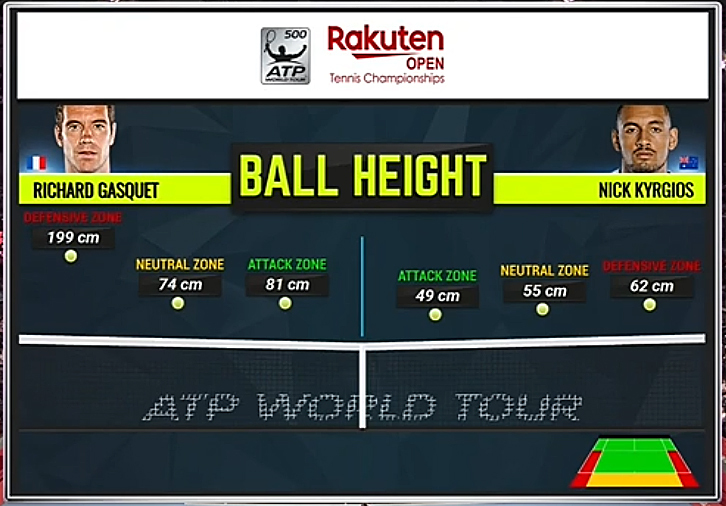 Defensive zone is suprizing, very different tactics from both players, perhaps one of weaknesses of Kyrgios? doesn't need to be so obvious. but, you can attack only the fh, and still play your A game of baseline grinding. i'd beat them the first set, with my A game, then the second set tried beating them with my B game (s&v). (in general you need a good sense of how you're winning/losing points). Though Gasquet won that match but I think you have to play your game in the end. For me throwing up a loopy moon ball on wide defensive shots is the best I can do. you get to hit with fed? lucky you! So from simple playing at the court, now you worry about giving vibe and save face, etc. Isn't that a bit much? What I refer to "not trying your best" is that you go from your A game to your lousy B game. Everyone with half a brain (well after some time playing) would know something about someone's strengths and weaknesses. When someone isn't competing with their best stuff, make stupid bad shot selection, people know. Besides, rec tennis is forever lop sided, uneven. We all know someone who's never good at the net, it's strange to see he suddenly comes to the net. Most likely he won't continue that play for long. dude, when you get punched/kicked/subbed enough... it's pretty obvious who's better/worse.... there's no excuses, there's no bad line calls... just one guy on the ground and/or tapping and/or unconscious. problem is, is you've battled through enough injuries you realize, the recovery time (sometimes months to a year) is just not worth battling for dominance. Yes but if you are stretched completely out of court hitting a high arc spin shot or a slow slice is the best tactic, if you hit a low clearance shot the ball gets to ur opponent faster and you are not recovered yet and leave the open court. ok, you do what you do then... (you missed the gist of what i'm saying). actually if you're stretched completely with little chance to recovery.. best shot is to go for a low % winner. Omg, so it seems like I'm the only guy (and now you) that I know who has a different philosophy to tennis. Specifically, the unselfish, friendly, help each other philosophy / approach. We can play matches where I spot them advantages to level the field -- see, I'm not out to destroy anyone. If I win I will raise the advantages, until our matches seem balance. That way, everyone, at almost any levels, gets to play. Reality is it's very hard if not impossible to find equal level players. I appreciate your approach, but for me I like to get smoked. I got smoked almost every time I played in high school my first year. It really pushed me and I got a lot better. I still like that type of experience because it's such a challenge while it's happening and I feel like I learn a lot more that way. Unfortunately these days it's very rare that someone will smoke me, not because I'm all that good, but just because I don't run into that many full time players any more. So while I don't like to lose, I do like to get completely smoked. It's great experience. Well yes I said slow slice, and high arcing spin shot, I guess you can call it a lob depends how far ur off court, sometimes its enough to high a high arcing spin shot compared to a drive shot, to get just enough time to recover properly. then you need to go into hitting patterns that favor your supposedly weaker practice partner. Yes, some are super inconsistent, like some guy I play with from time to time that I played when I started, his shot is all over the place, flies in the back fence, or is some short wannabe misshit dropshot, or going completely left or right off court consistently, its quite hard to make anything like that even when you feed him nice balls right into him, but he just shots all over. so given everything i said above about how to play with lesser skilled players..
c) will typically opt to serve for an hour, over hitting with someone random... every time. Yes but I played with him when I was a beginner, can't tell him now "look man ur not good enough i wont play with you anymore" lol, thats mean, it can be fun sometimes..
yeah, i'll play with friends, regardless of levle..
then chase every ball (cardio workout!) even if it's half court over, or just about to hit the back fence. Yeah ... I use the “sneaky” approach with my rookie rather than bringing up the idea of spotting points. I go for low UE 2hbhs ... like hit the sideline on dtl. Good practice ... and then when rookie is up 9-5 or something in 11 point cames, play 100% trying to miss nothing. Good concentration practice. Most of the time I come back and win, but if I will tempt fate at 10-9 and hit to his FH. On some of those he will hit his best FH of the day ... clean winner cc to my bh corner. Inside I enjoy his shot as much as he does ... but I call him a lucky *** ... makes him enjoy it even more. If he gets to play a lot in the future, and drops some weight ... his FH could be lethal. I wouldn’t subject him to ttw ... but it would good to see if others saw the same potential in that wing. Yeah you never see male pro players get legit overpowered like you do at (most) amateur levels. I watched only his video with Shroud and he wasn’t hitting very fast but no doubt he’s a good player. Would love to see other match or practice videos if there’s any or he posts here. That is me with that one partner...but dang it gets a bit frustrating after a few years of this. More to come. Now we know you're good at video editing. I wonder if you could recommend a good editing program to be used on Iphone. I want something that will allow me to do two basic things: cutting out multiple unwanted parts in a video ( not just the beginning and the end of a video that most simple ones let you do) and change the speed of selected parts in a video. That's all I want. I have been searching for this for a long time but no results. You're my last hope. Oh the reason why Iphone is that I find uploading to youtube from iphone is much faster than on computer. Guys were probably *required* to play with you in high school. The problem at adult rec tennis court is no one is required to play. I'd like to be challenged by the 20 something group or some college level players that show up once in a while too but they do not feel like to associate with lower level players like myself. Likewise, I do not feel interested in playing (and beating) 65+ years old men, weak women and newbies in *a straight game*, either. Their tennis is simply not challenging, thus not interesting. And when they lose, they also use their age as an excuse. It's simply not interesting to compete in a lopsided game. Lopsided competition is actually an oxymoron. That said, I'm actually able to set up a small group of bet game players. Me + 4, 5 other guys + a woman. All of us are competitive and we arrange teams and handicaps in ways that seem playable (in everyone's mind). We are able to play some serious games and then talk about them afterward. Ooops sorry my post below was supposed to be a reply to tlm's post about @nytennisaddict . Have you ever watched his videos? He hits the ball very well with plenty of speed. He is a very good player and probably better than at least 90% of the guys on this site. @nytennisaddict doesnt swing hard in his vid vs Shroud? Lol, it looks like its harder and with much more spin than most people here. Not to mention shots are faster and more potent in real life, on vid they look much slower. I wonder how many UE you would make off his weak shots, what do you think? Could you consistently return them over and over while moved around with them? Hey ... my 60 year old tennis is challenging ... for me. There is certainly something to be said about making the best of your circumstances for sure. At least during the summer we have some tournaments close by where you can enter and at least be guaranteed 2 matches. I've had some real good matches in some of those local tournaments and if you're a little lucky you can find someone suitable to hit with. But we are for sure limited a lot of times by who shows up and you just got to do the best you can. See. That's a big problem that I also run into. My way of solving it is I gotta open up to play *anyone* but still maintain *quality competition* also. How? As said, by successfully conveying to them (who's willing to listen anyway) that it's very hard to pick and choose players or wait for same level players. Forget pride and ego. We likely cannot beat someone 20 years younger or seriously athletic. I told my older friends that there's no way they can come close to beat me in a straight game. Over the holidays I came out at irregular time. There were only a handful of players and certainly their skill levels were all over the place. These guys couldn't get a decent game on and they left one by one. I didn't want my time to go to waste. I called up my regular match-playing friends who I usually play for lunches. There were only 3 of us but everyone was so competitive and serious. We played some intense 1 vs 2 in best of 3. We had a great time. I'm pretty sure I can return all his balls. But just get rid of the net, will you?! - short tie breakers like first to 4 points, win by one. The guy out isn't out for long, and rotates in without a long time out. Either play winner stays on ... or just rotate out after two tie breakers. - rotate server in each point ... never out longer than one point. If you have doubles only players, 1 vs 2 is about all you have to play points. Did you have a good time at AO? It's always the best time of the year for me. I love going there watching practices and matches on outside courts. I rarely go to stadiums and centre court. I'm finishing work early today to go there in the afternoon and will take the next week off when it officially starts. iMovie is free and comes with iPhone. That is what I use for almost everything. Can simply split clips and delete unwanted sections and allows you to change speed on clips. My friends and I play both singles and doubles (in traditional sense) and variety of formats. You know that rec tennis is pretty much rule-less, right? I know a few who consider themselves playing tennis but come to the courts to rally or serve buckets and buckets. Who's to judge? We have played A vs B, B vs C, C vs A in altered singles when there were not enough players. We really don't care about too crazy, unnecessary formats. We try to stay with regular sets and points that everyone already knows PLUS necessary handicaps. If I introduce too much variety, they will complain confusing. One time one older man said that he could hit well but not run well, especially in extended rallies. So, I proposed that he only needed to sustain 3 shots to win if a point drags out. (the idea is to never get into a prolonged grinding) We tried to play a few points and he complained he got confused by having to count his shots! LOL. Sounds awesome. I have never been to a major, but went to Indian Wells before it got bigger with Ellison. My favorite part was the smaller side courts. Thanks. I guess I haven't been able to use its features then. Will look into that. Good for you making pick up tennis work. I played a lot of public park tennis in my 20s, but always singles with friends or someone I met in tournaments. Once I was on a contract out of state, and asked my apartment manager where are the tennis courts. I drove over, watched some guys around my level playing doubles. I walked up to the fence and told one of them I could beat them easily ... with a big smile on my face. After they found out I wasn't crazy or an a $ $, they invited me to play singles that weekend on their team that weekend. They never told me it was clay ... so I never got to tell them I had never played on clay in my life. I played with those guy's all summer ... they had beer doubles tournaments at all the clubs and big public courts. If you lost early ... beer all weekend. i swing fast, for me, but i don’t hit big. according to sony, my avg groundies are in the 50s mph. I have no doubt that curious (or anyone here) can handle my pace especially in a coop hit. if my 80y old 3.0 dad can maintain a consistent rally while i’m bashing at him, i’m pretty certain most folks can. Isn't that a good memory to have? To play good games we have to take some risk. Put ourselves out there. Thanks ChaelAZ. iMovie is really fantastic for basic editing. It is exactly what I needed. This is a small piece from today’s session, mostly to practice some video editing. You guys will love the upcoming one though! Is the next video a biggest loser style reveal?? Here it is. I was at the best spot again. What a pleasure, man. Enjoy. You got it man. Good video and like the slow motion. And Domi is my all time favorite WTA player. I posted years back about using her as a template for forehand technique for rec players and it was funny how many guy get sexist about it, but it is such an simple and effective stroke. It is unfortuate guys can't get out of their own prideful way to improve. But her footwork and attitude are epic. Thanks for posting! And my favorite ATP player! You da man! My goal is to have as solid a shots in matches as Thiem has in warmup, lol. Interesting how he uses that drill of catching the fh follow through in practice. Cibulkova is my favorite, you will have to pick another.